For over twenty-five years, the History of Education Quarterly has served as the meeting ground for a generation of the leading experts in educational and social history. For scholars and students alike, Edward McClellan and William Reese bring together the major ideas of some of its most prominent contributors. 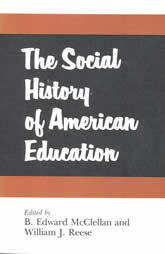 Bridging the span of American education history from the colonial era to the present, these essays offer extensive coverage of such topics as women’s education, the education of minority groups, and the social dimensions of educational reform.